In this article, we will be discus about a design principle called Tell, Don't Ask. This principle is aimed at designing the classes in such a way that, when they are used, instead of querying their object/instance and performing the operation based on the output it provides, the instance should handle the logic itself. In other words, it means, the instance of the class should take the decision itself, rather then calling code telling it what to do. So let's discuss with a code sample which violates the principle and than will implement the same using this principle. Consider the following piece of code. Here, we have the following business logic implemented. We check for the discount applicable on the vehicle. If it is greater than 5%, we subtract 5000 from the actual price else 3000, as a discount. We also have a net price price defined for the vehicle. After applying the discount, if net price is more than this base price, we can further provide free accessories else we do not. 1. If we have same type of logic in other areas of application, changes in the logic will require changes in all the locations. 2. 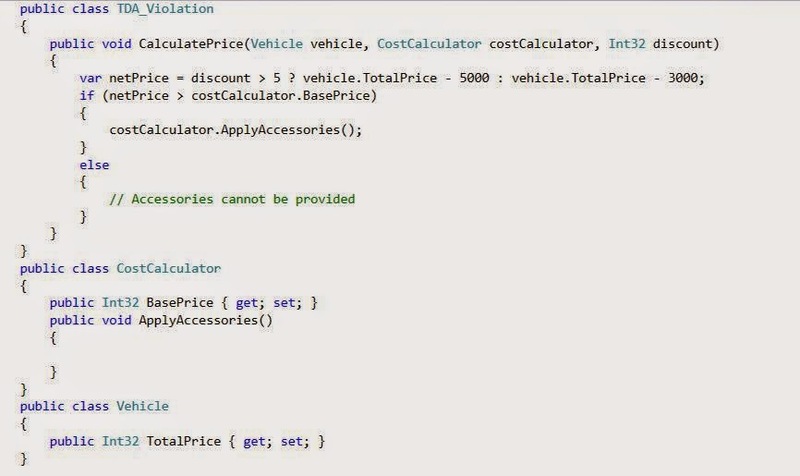 Client code is now aware of the business logic to calculate the cost of the vehicle. 3. Some of the member functions/properties are unnecessarily exposed as public members, to the client code. 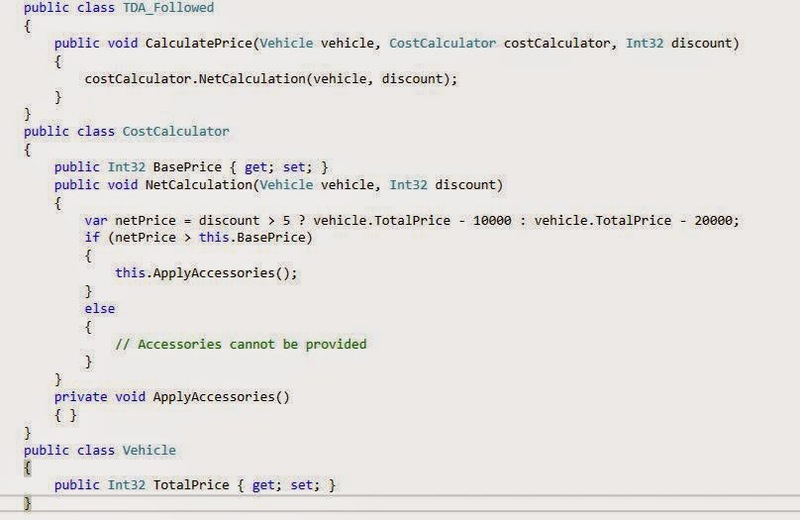 So in this case, the entire calculation logic, along with logic to add accessories, inside the CostCalculator class. We simply provide the required data as input to this class. Further, the ApplyAccessories method is now converted into a private method and client code has no idea of the cost calculation business logic. Client code will simply pass the data to the CostCalculator and rest will be done by its NetCalculation method. In other words, we are telling the CostCalculator instance to perform the calculations, rather than asking anything from it.